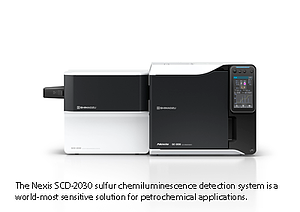 Shimadzu has released the Nexis SCD-2030 sulfur chemiluminescence detection system consisting of a Nexis GC-2030 high-performance GC and the newly developed SCD-2030 sulfur chemiluminescence detector. With this product, Shimadzu serves a growing request for easy operation and maintenance as well as high stability even during long term operation for high selective and sensitive sulfur detection systems. The sulfur in fossil fuels not only causes air pollution, but also interferes with catalysts during chemical reactions. Petrochemical companies are making efforts to reduce the sulfur content of fuels and have developed low sulfur gasolines containing only several tens of ppb or less. To accurately measure trace amounts of sulfur in fuel, a high sensitivity SCD detector is essential. Against this background, global sales of SCD detectors are expected to increase steadily in the future, and demand is growing for instruments that excel in highly sensitive detection. The Nexis GC-2030, a next generation gas chromatograph, offers the highest level of performance. It is based on the concept of superior usability and expandability for a wide variety of analytical applications such as research and development and quality control in areas such as food, beverages, fragrances, gases and fuel cells. For these purposes, the Nexis GC-2030 can be equipped with any of a family of high-sensitivity detectors such as the newly developed sulfur chemiluminescence detector to create the Nexis SCD-2030 specialized system. It will deliver a new solution for low concentration sulfur component analysis to a variety of users. Combined with the LabSolutions analysis data processing system, the entire workflow can be automated to support efficiency while minimizing the influence of human error.